PROS & CONS of Keeping Buff Orpington Chicken! March 7, 2016 April 3, 2018 - by Gold Cochin - 5 Comments. Well, Monday is here and we at the typesofchicken.com team are going to keep the promise we made to our readers. It is time for another article about pros and cons of keeping some chicken breed. Last week we gave you the pros and cons of keeping Silkie chickens, and the week before that we gave you the pros and cons of keeping the Rhode Island Red Chickens. After a brief discussion with the team, we decided that this week`s pros and cons will be about the Buff Orpington chickens. So without any further ado, the pros and cons about keeping Buff Orpington chickens brought to you by the typesofchicken.com team. 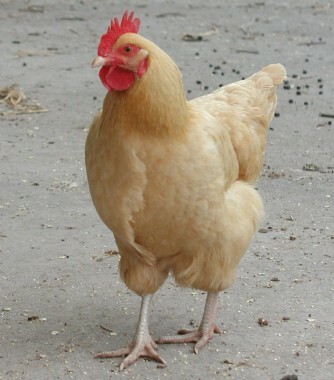 There are many dual-purpose breeds out there but the Buff Orpington breed or the Orpington breed, in general, is famous for their dual purpose. What makes them very special is that because they are big and the arrangement of their feathers they can be good egg layers during the winter. Some people say that the Buff Orpington are friendlier than the Silkies but we at the typesofchicken.com team think that comparing the friendliness of some breeds is a complete waste of time. The Buff Orpingtons are a very friendly breed and this makes them perfect for any flock. They can be literally kept for any reason in your backyard if you want to keep them as pets – you can, if you want to keep them for eggs – you can, if you want to keep them for their meat – you can. It is recommended that you get one of these if you have children that enjoy playing with the flock. 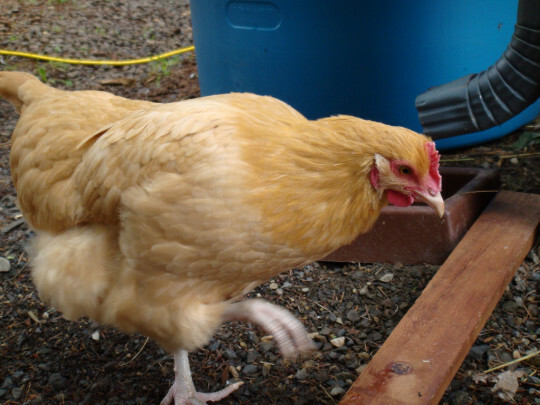 Most of the Buff Orpington chickens that you can get anywhere are heritage – it is rare that chicken breeders that sell this breed are mixing them. This is a big pro for this particular breed because that means that it is guaranteed that you will get the maximum of this breed. If you make sure that the Buff Orpington that you are getting is 100% heritage you will get everything you want from your chicken. Many chicken breeders prefer the smaller breeds of chickens like Silkies for many reasons such as lack of room in the coop or the run or that their flock is already full for breeds such as the Buff Orpington. 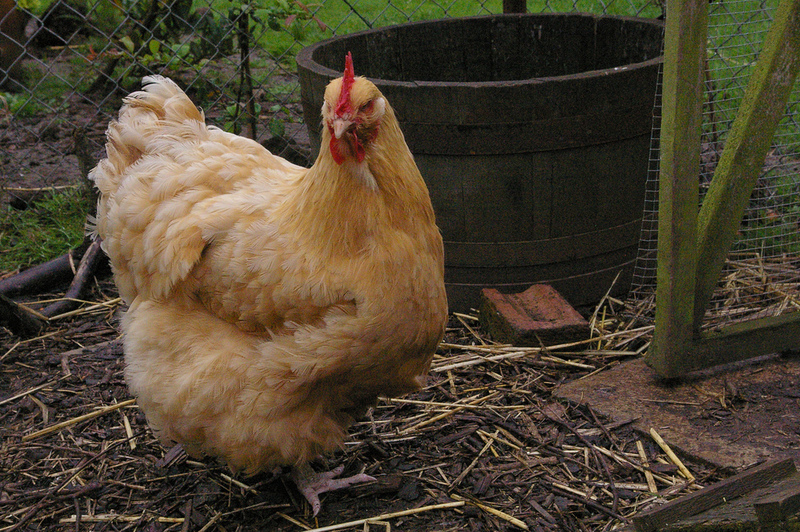 Some chicken keepers also think that if they introduce a big breed such as the Buff Orpington to their flock that they might disturb the already-formed pecking order. 2. Maybe they are too good to be true? Their friendliness and the fact that they are a heritage chicken breed may cause some confusion with some novice breeders. If they are represented to be one of the most perfect breed of chickens on the market it doesn’t mean that they don’t require the regular amount of attention. The Buff Orpington is one of the best dual – purpose breed, but only if you prepare them properly for it. They require the same amount of feeding as any other bird. Don’t let the fact that they enjoy sitting on your lap give you the idea that they don’t like playing with some toys. Other than this and the fact that they sometimes tend to lose more feathers than other breeds (not yet confirmed) we at the typesofchicken.com team agree that there are not any significant cons about this breed of chickens. Next Article Uses for Chicken Feathers – DIY projects!!! I have had Buff’s for years now, my two girls are getting up there in age so I got 4 chicks to keep Buff’s in my flock. Great egg layers, good temperament. As for loosing more feathers, I haven’t seen that at all! Actually the Buff’s don’t appear to get as bald during molt as the others. I’ve had 3 or 4 Buffs for years a part of a mixed group of layers and would raise meat kings for meat. 3 years ago I decided to raise my own birds for meat and decided to go with the Buff Orpingtons as a dual purpose bird,it was a good decision. We moved to the country late 2015 and got our first livestock animals the following spring: Three 2week old buff orp chicks from North 40. We lost one that summer to a coyote. Another one died early spring from sour crop. I just euthanized the last buff orp hen yesterday. She died of egg yolk peritonitis. That was very difficult to deal with. When she became a lone hen, she and I bonded. Through my hours of research, I found other people also lost buff orps to EYP. Someone asked if this was possibly an issue specific to this breed because she lost 4 of her 12 buff orps the first year to EYP. It could be a problem common to the breed or it could be that she came from a feedstore who bought her from a breeder who didn’t put any consideration into good genetics. I emphatically agree this breed makes a wonderful pet, if that is your desire. All my buffs were sweet, gentle, friendly with big personalities, especially my last girl. If you’re raising them for meat, might be hard to select a breed that follows you around like a puppy. I sure couldn’t do it. I bought five buff orp chicks in early May, intending them to eventually be my pet hen’s new flock as well as seven white Chantecelor chicks. All five of the new buffs are just like my original three. They are so friendly and sweet, always chatting to me. The other breed, Chantecelors, are flighty and want nothing to do with me (even though they too are advertised as friendly and docile). Their purpose is to be meat chickens so that makes it easier that they are A holes. I do recommend the buff orp, but know they have a way of working themselves into your hearts. The hen I lost yesterday, was given a proper burial as I would do for a pet, and I am mourning her deeply. If you go with this breed, get at least a half dozen because if you end up in a situation like I did with one lone hen, you will end up loving her and setting yourself up for heartache down the road. I know this is a long shot for a reply but I’m desperate ! I’m watching my moms two chickens over the weekend and it seems as if they got attacked by a fox! She had a buff and a Plymouth Rock and they were the best of buddies . Only the buff survived and she is hurt pretty bad on her back . I’ve been treating her wound but I’m also worried she won’t heal because of loneliness ! She’s been eating , drinking , and pooping and even layed an egg. The buff wanted nothing to do with us before the attack but she’s been very good with letting me take care of her . Should I hurry up and get another chicken before my mom gets back from vacation ? Also she is pretty bossy . Not sure if you know what other breeds work best . Excuse my grammer . I’m on my 4th night shift . To Little sister, I had 4 chickens until yesterday afternoon. I have 2 RI Reds, and a Plymouth Rock and had a Buff Orpington. I got them all the same day, one day old chicks. I got them last May 1,2018. Yesterday morning when I pit their feed and water in the coop, they all looked fine. At lunch time, I added water and they looked fine. When I got home after work at 3:30, my Buff Orpington was laying on her side dead. There was no sign of trauma, no bleeding anywhere. She looked as though she laid on her side closed her eyes and died. I was soo very UPSET, she was my favorite bird, friendly, liked to be held. I called her Daddy’s girl. She may have died because of this egg yoke peritonitis, of which I have never heard of. How can you tell she died of this. I buried her near the coop. The 2 reds sometimes let me hold them, but the Plymouth Rock wants NOTHING to do with it. My last flock of 3 birds were RI Reds, and I lost the “runt” when she was 3 yrs old. She to was my favorite, because she was friendly. Please get back to me.